Sometimes the question requires you to go through a lot of detail and analysis. Here’s an example. Instead of lamenting why the boys didn’t do the experiment with one object at a time, let’s dive right in. – Image 2 shows C and D are conductors. – Image 3 shows A and D are conductors. – Image 6 shows F and C are conductors. – Image 1 shows B is non conductor, since A is. – Image 4,5 shows E is non conductor, since A and F are. 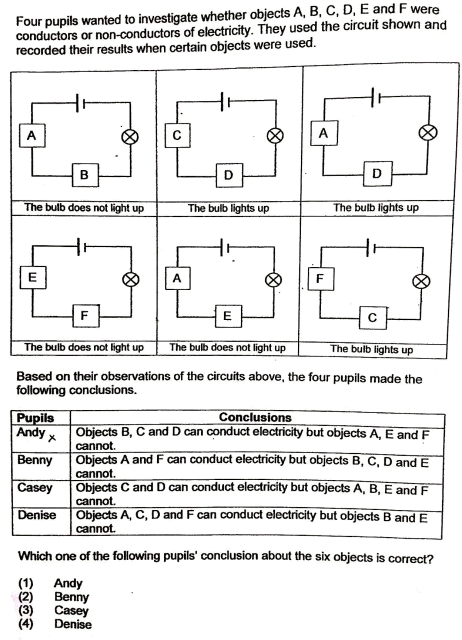 Therefore B and E are non conductors. Therefore ans is (4) Denise is correct. This entry was posted in Science and tagged Elimination. Bookmark the permalink.